Technically speaking, Dave Bidini isn't in the Rock and Roll Hall of Fame, but given his status as the former frontman of the Rheostatics, we think he probably deserves to be. It's only fitting, then, that the Canadian rock hero's Bidiniband will be releasing the album In the Rock Hall on January 24 via Pheromone Recordings. According to a press release, the LP is an "expressive, white-hot rock'n'roll statement" with lyrical concerns that include "pirates, war, dating, travel, the Smurfs, engines, the waterways, and movie-making." 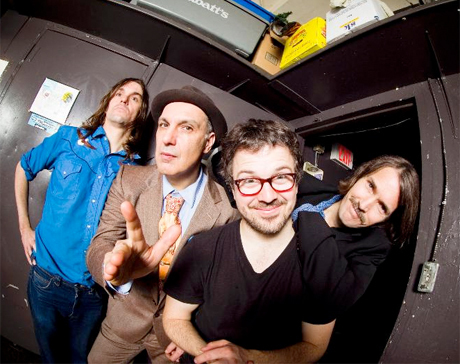 The album, Bidiniband's second, was cut in just six days at Toronto's Revolution Recording studio with Bidini's longtime band consisting of drummer Don Kerr (Ron Sexsmith), guitarist Paul Linklater (the Pinecones) and bassist Doug Friesen (John K. Samson, Peter Elkas). It was recorded almost entirely live of the floor with just a single guitar overdub. Download the single "Last of the Dead Wrong Things" for free right here. In the Rock Hall gets its name from a poem by late writer Paul Quarrington, which you can read here. See a live version of the title track embedded at the bottom of this page. Bidiniband will be promoting the album with a smattering of shows in Canada's eastern half. For the official CD release show on January 28 at Toronto's Dakota Tavern, they will offer "surprise guests, noisemakers, amp throwing, squirrel-toss, balloon drinking, dart poker and underwear bingo. And, one really good drum solo." See the full schedule below. Bidiniband Performs "Big Men Go Fast on the Water"
Bidiniband Performs "I Want to Go to Yemen"